Anyone who has watched Florida Gators basketball season knew what to expect when the hosts were looking to pull off am upset of the No. 7 Kentucky Wildcats while leading by 11 points early in the second half: a collapse. And that’s exactly what happened Saturday at the Stephen C. O’Connell Center as Florida (12-9, 4-4 SEC) was outscored by 22 points to end the game in a 65-54 victory for Kentucky (18-3, 7-1 SEC). Let’s take a look at what went down in Florida’s latest loss. It was over when … senior center Kevarrius Hayes missed two free throws with 13:18 to play. 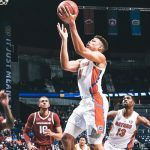 OK, not exactly, but that was the last moment the Gators had the upperhand in the game, and it was clear from the second his last free throw clanged off the rim. Florida had just busted open an 11-point lead with a 9-0 run, using six offensive boards in 6 scoreless minutes for Kentucky to get the O’Dome crowd riled up. Hayes had a chance to extend that advantage to 13, but it was as if both free throw misses jolted the team back to reality. As the Gators went on a 5-minute scoring drought, the Wildcats immediately took off on a 10-0 run. Florida was able to retake a five-point lead a couple of minutes later, but it did not hold onto it for long. Kentucky responded with a 14-0 run to go from five down to nine up on the hosts and put the game away. In all, the ‘Cats took advantage of Hayes’s misses to end the game on an extended 34-12 scoring stretch, turning an 11-point deficit into an 11-point victory. Exceptional efforts: None really, though redshirt senior guard Jalen Hudson played OK with 11 points on 4-of-8 shooting. 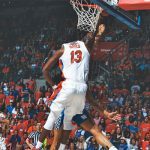 Hayes made a couple of mistakes late, but his tremendous post defense (three blocks, steal) and overall presence inside kept UF in the game. During the game, Hayes (191) passed Al Horford (189) to become No. 2 all-time on Florida career block list. 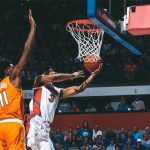 What it means: Florida still does not have a Quadrant 1 victory this season, and Kentucky was just the start of a tough stretch that could make or break the Gators’ chances to make the NCAA Tournament. It was clear that UF played with a significant amount of energy over the game’s first 30 minutes, but its lacking depth — particularly inside — and the overall talent disparity ultimately caught up with it. It must win at least one of its next two games to have a chance at making the 68-team field. Up next: The Gators lost their first of three straight difficult games, the next two of which are on the road. Florida will face Auburn (the first team out of the polls) on Tuesday at 9 p.m. ET before travelling to No. 1 Tennessee next Saturday.